Have you ever felt like you were drifting through life with no true direction or purpose? Or felt like you’re just working for the sake of working, that you don’t love what you do, or that you aren’t making a real difference? I know I have! I wanted to be more, to really make a difference. But I didn’t know how. And more importantly, didn’t believe I could. So I fumbled my way from job to job with no purpose and no passion in my life. Forget Making a Difference… I was Trying to Earn a Living! Living or working in a situation you didn’t consciously choose is frustrating! It can easily lead to feeling trapped. And feeling trapped is one step away from feeling hopeless. You understand; feeling hopeless quickly kills personal success and drains happiness. That’s no good. It’s no way to live. When I awoke to the fact that we all have the power to choose our thoughts and feelings, and by extension to choose who we are, I also realized that we each have the power to choose our life’s path. That means that if we aren’t happy with the way things are, it’s within our power to change them! And more than that, it’s our responsibility to change them. We alone are responsible for the impact we have on those around us and on the world. 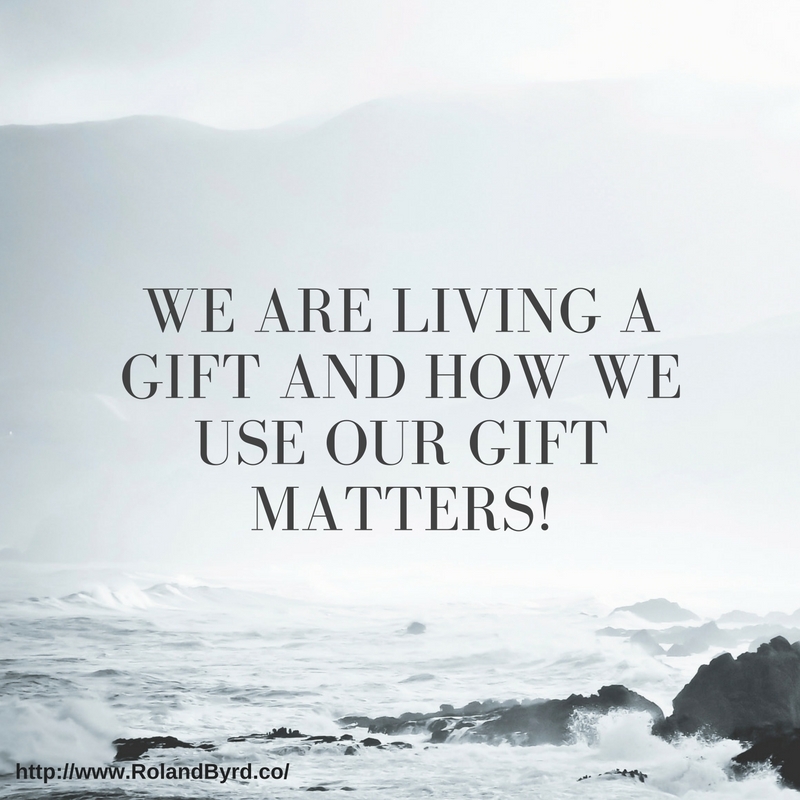 We are living a gift and How We Use Our Gift Matters! The only way to truly maximize the gift of life is to Discover Your Passion and Live It! I call this knowing Your True North. It’s only through living your passion that you’ll reach the full height of your potential. You might be good at your job or career, you might even make good money, but if you’re not using your passion every day you’re selling yourself short. And worse, you’re cheating the world out of your gift. Only through living your passion can you move others to be the best versions of themselves. When you’re living your passion you feel happy, fulfilled, and inspired. You lift others without effort. Think about the last time you witnessed greatness. It lit a spark that reminded you of your greatness. It inspired you and reminded you that you can Unleash Your Dreams! When you’re living your passion others witness your life—what you’re doing, how you’re living, and that you’re passionate about what you’re doing—and they’re inspired to become more, to strive harder, to unlock their greatness. And isn’t that the best gift you can give another, to help them discover their true potential? 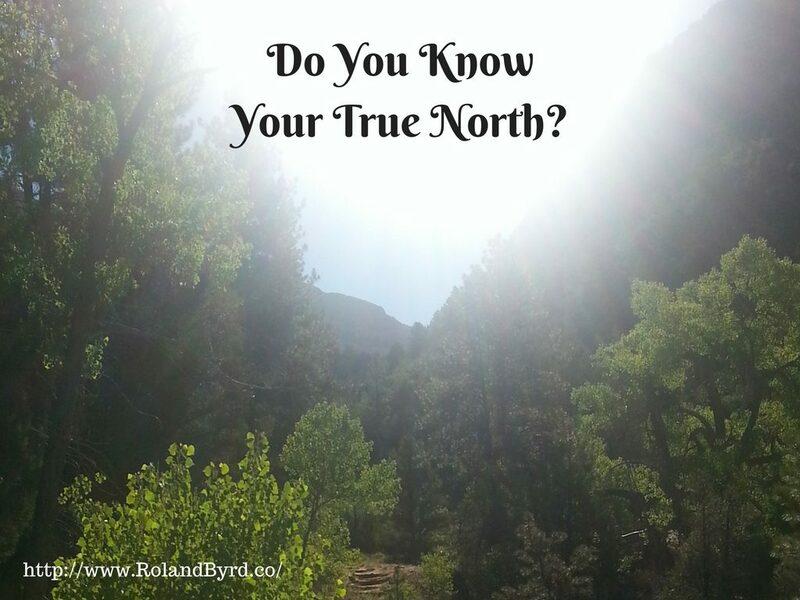 But how can you do that if you don’t know what Your True North is? You’ve got to Discover Your Passion! To help you Discover Your Passion I’ve created a downloadable worksheet. Discover Your Passion walks you through the exact steps necessary to find out what you’re most passionate about. Once you know your true passion you’ll start living it! So go ahead and download Discover Your Passion now, follow the directions, and start unlocking your true potential! Stay tuned. Next time we’ll cover how to start Living Your Passion. What is Personal Accountability and Why Does it Matter? This seems easy enough to answer. Many people think of personal accountability as accepting responsibility for the things you do. Some tend to narrow it more by thinking personal accountability is related only to things that they or others do wrong—being accountable for one’s mistakes. But it’s more than that. Much, much more. Personal accountability means accepting responsibility for your life, Your Whole Life. This might seem extreme. It might make you uncomfortable and set off alarms in your mind. After all, haven’t things been done to you by others? Hasn’t life thrown you a few curveballs, maybe even blindsided you a time or two? Haven’t things happened to you that were outside your control? So how are you accountable for those things? And doesn’t that mean you can’t be accountable for your whole life? The answer is, of course you aren’t responsible for what others, life, or nature do to you. You have no control over others. You have no control over nature or the weather or random acts of chaos. And yet you are still accountable for your whole life because you have the power of choice! You choose what these events mean to you. Your actions related to any event—or series of events—are based on the meaning you’ve assigned. If someone hurt you and you decided to never be a victim again because of that, then that’s the meaning you’ve given the event. Your actions are going to be very different from the person who was hurt and decided to never trust anyone again. If you survived a severe accident and that gave you a new appreciation for life, your actions are going to different from the person who survived a similar tragedy and now lives in fear. 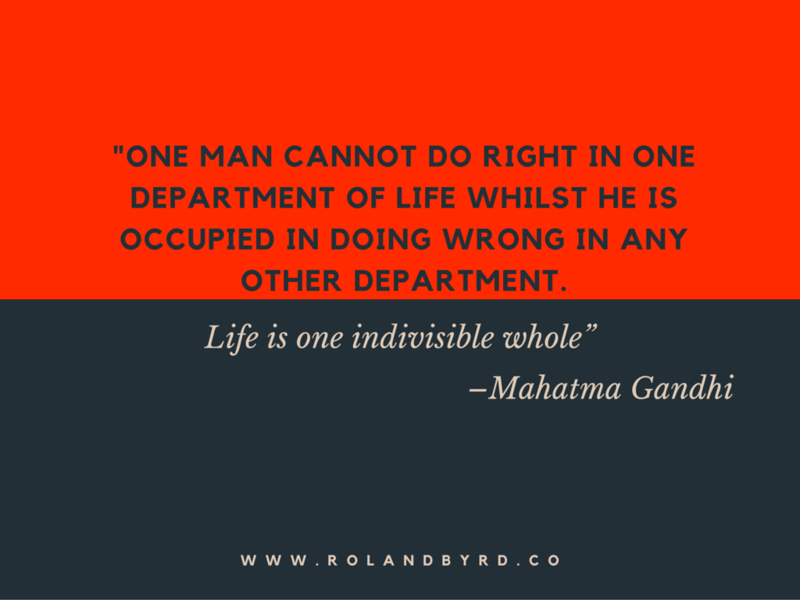 Why Does Personal Accountability Matter? Through choosing the meaning of things that happen to you, by being accountable for your life, you create your future. Okay. That’s great. But how does personal accountability equal freedom? 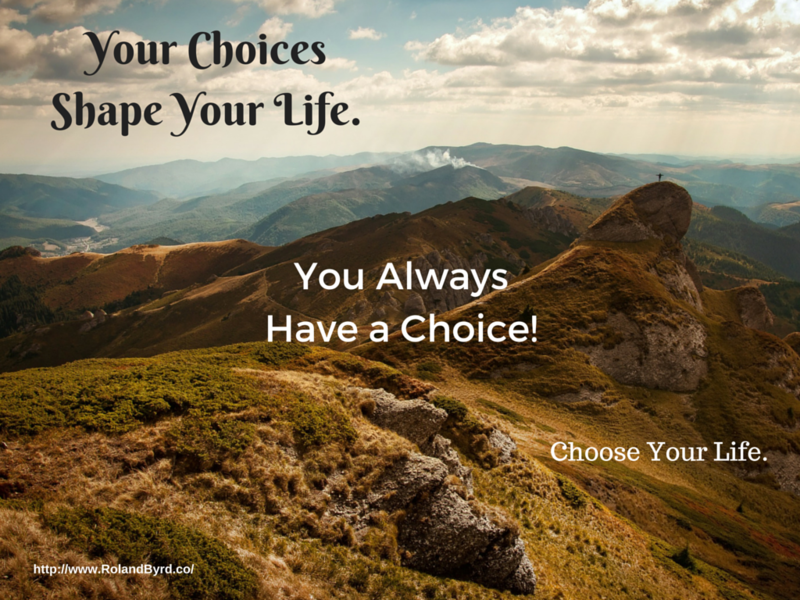 Understanding that your choices create your future–and that the meaning you give events impacts your actions—allows you to realize that no matter what happens, you get to choose what you’re going to do with it. You get to choose. You choose your thoughts. You choose the meaning. You choose your actions. You choose the path of your future. No one can ever take away your power of choice! Be honest with yourself when asking these and open yourself to possibilities you hadn’t considered before. You can even write down your answers. I’ve found that helps in examining all the possibilities. These questions allow you to re-frame the thing that bothers you. For example: I was at a movie with my wife and daughter last night. The person behind me kept accidentally bumping the back of my seat. I could have chosen to feel angry or cheated at these interruptions to the flow of the experience. I might have confronted the person behind me and asked them to stop. But I could tell it wasn’t deliberate. So instead of introducing conflict, I chose to use it as a chance to improve my patience. The movie was wonderful. I enjoyed it much more than I would have if I’d chosen to feel angry. And I grew as a person. That’s a win-win! Learn more about how you can feel, hear, and see the benefits of Personal Accountability in your life! Visit 180-U.com today. Why is Personal Development Critical to Professional Success? Without a habit of personal development, professional success is often short lived, stifled, or non-existent. You witness it all the time, an intelligent person with marketable skills never reaches their full potential, has trouble getting or holding a high-level job—sometimes any job, never turns a profit in their business, or they achieve success in these areas only to later self-sabotage and lose it all. Why does this happen? They have personal issues in their lives that have never been adequately dealt with. But we’ll come back to that. Some people also try to separate their professional lives from their personal lives—instead of healing or growing. They try to act one way professionally and another personally. They often develop different personas, one for each area of their lives. But the truth is segmenting one’s life never works because at the core, our values, needs, and beliefs drive our thoughts and actions in all areas of life. If you want professional success, you can study or train diligently and make yourself more valuable in the marketplace. And this works. You’ll progress further professionally by improving your knowledge and skills than you will by coasting. But unless you’re taking care of developing and growing as an individual—and that means evaluating your life and taking care of past and present personal issues—you’ll struggle reaching your full potential at best and at worst, you might hit a brick wall and derail your career entirely. It doesn’t matter if you’re a CEO, mail-room runner, business owner, or professional athlete, if you’re hauling around past baggage it affects your performance in all areas of life. Yes, all areas. Let’s clarify that personal issues aren’t necessarily show stoppers. They can be relatively minor things, like taking things personally, overthinking situations, and poor time management. Personal issues can also be things like inappropriate language, poor hygiene, relationship problems outside of work, even talking too much or not listening to others. Essentially, all behavior comes from emotional and psychological roots. If you’re behavior isn’t getting you the results you desire, then you must address the root of the behavior. That’s Where a Habit of Personal Development Helps Build Professional Success. Simply the continuing study and implementation of improving oneself. It can include books, seminars, video series, daily meditation, and many other facets. And at the core it entails healing what needs to be healed and improving the areas of life you want to improve. Maybe you’ve already realized the importance of continuing personal development and have integrated daily growth into your life. Awesome, keep it up! Maybe you haven’t. I can help you get started! 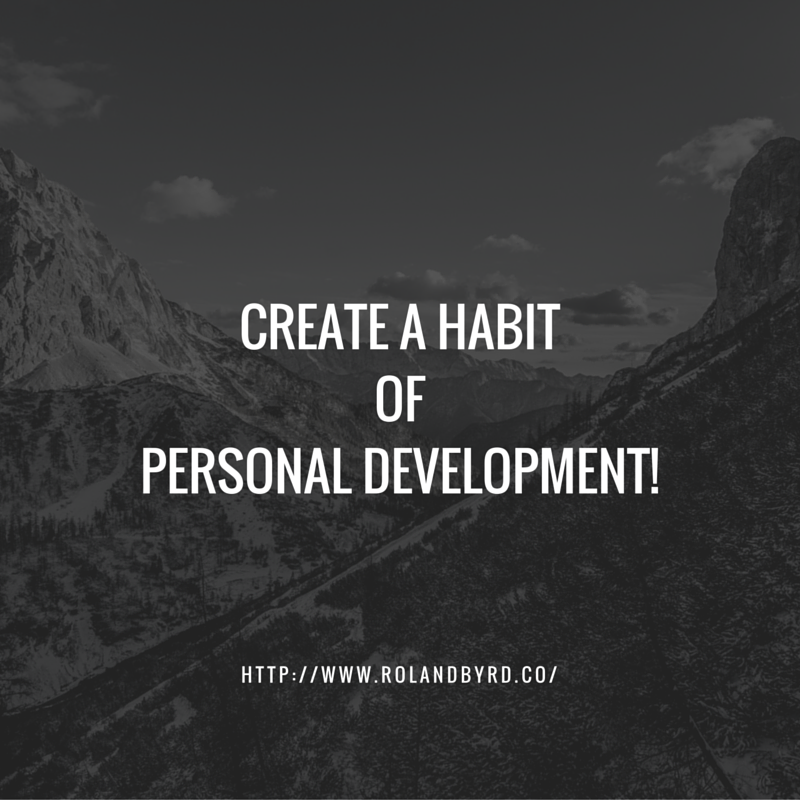 If the answer is, “Yes.” Then you’ll benefit from adding a personal development habit to your life! Here are a few things you can do to begin—or reinforce—your personal development habit. Daily Meditation. There are many ways to meditate. At its simplest, meditation is taking the time to reflect on the events going on in your life. Meditation can also be clearing your mind of daily clutter by sitting in silence and focusing on your breath. The benefits of daily meditation are numerous. Among them are increased health, the ability to think more clearly, increased calmness, and improved mental focus. Goal Setting. Without goals it’s hard to hit your target. Think of your biggest dream. Write it down using language as if it has already happened. Date it with a realistic but challenging achievement date at the top of the page. Review this daily and Start Working Toward Your Goal! Study Personal Development. There are many sources for inspiration and guidance in the personal development arena. Find books, videos, or online courses that fit you. Start studying and implementing your new knowledge. I have a few books on personal development. You can read my books or find other authors who work for you. Either way. Get Started! 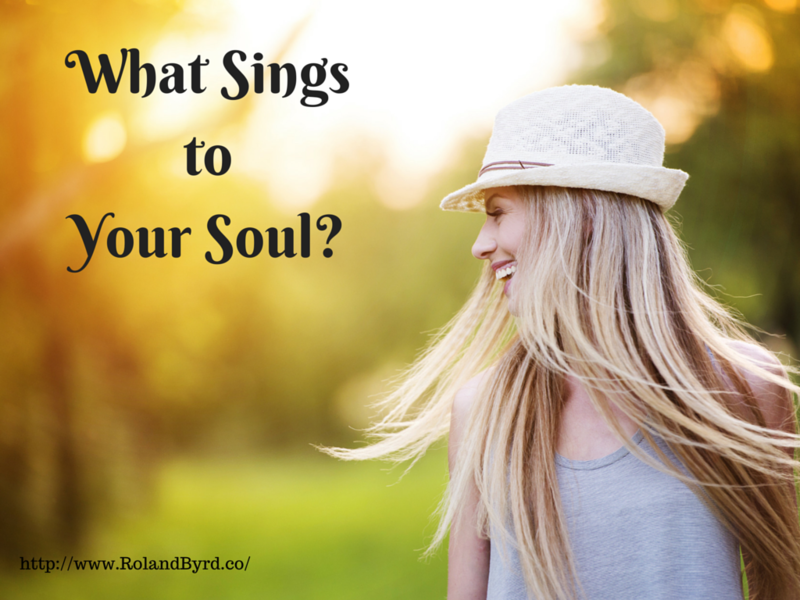 What Sings to Your Soul? Whatever it is, when you find it, nurture it, believe in it, and share it. Things we hoard never produce joy. But the smallest planted seed can, in time, produce a forest or a meadow full of flowers. Share your gifts. In sharing you grow. I used to think life was about the destination. I hurried to get where I thought I must be. Living that way wasn’t living. The days blurred past with no meaning. I’m no longer in a hurry to reach tomorrow. Yes, there are things I’d love to change about today, but I live each day as it comes. I experience each day. The days of my life are no longer merely stepping stones to the future, they are life! The point of any journey is who we become and what we learn while traveling it. Infinite possibility lies before us. When you discover the things that sing to your soul, you’ve discovered the keys to your purpose, your path. The things that fill you with joy, that you’d do just because you love them, are your gifts. Explore them and ask how you can use them to help others. Doing this ignites creativity and passion in ways that will astound you. The gifts we’re given aren’t meant for hoarding. They are meant to be shared, to help others, and to make the world a better place. As you approach this moment, this gift of time, make the choice to share your gifts. Not all will appreciate them. Not all will care. Some might even call you crazy. So What? Do what you do from a place of love and ignore those who don’t understand. I challenge you today to start using your gifts to help others. If you don’t know what your gifts are then you can download my Discover Your Passion worksheet, figure out what they are, and then start using them! I f you want to bring your goals and dreams to life you’ve got to take action. And not just any actions will do. You must take actions that drive your dream forward and that streamline the creation process. But how do you know what actions to take? How do you know if you’re taking the right actions? How do you know when to take them? How do you know if your actions are working? “The Law of Action!” reveals why you aren’t reaching all of your goals and gives you easy to follow steps to make sure you reach them from now on. Click this link and add the book to your cart. Then checkout and I’ll send you your signed copy when it’s hot off the press! Remember; with the New Year approaching, Now is the Perfect Time to start using the Law of Action in your life! Make this a banner year! 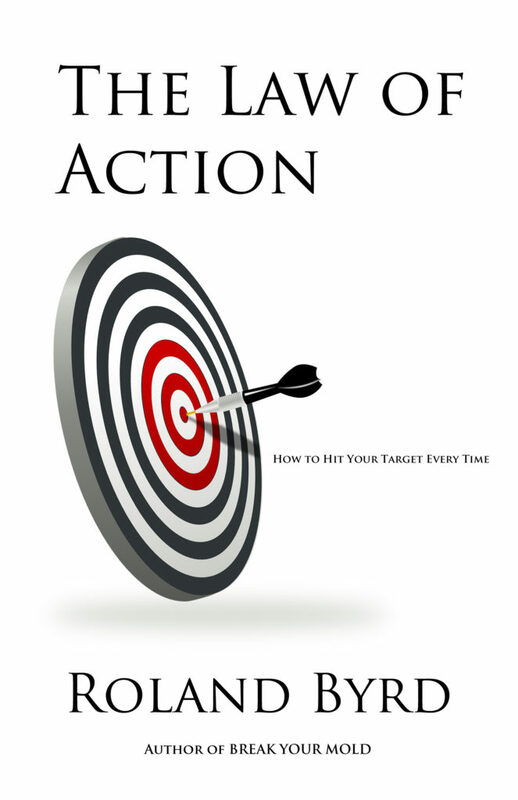 Order your copy of “The Law of Action!” Today. Please share this post with your friends, family, and everyone else you think might benefit from implementing the Law of Action in their lives! If you’re serious about making lasting changes in 2016, changes that will impact the rest of your life, pre-order your copy of The Law of Action today!